This 3-part lab covers selectively permeable cell membranes, hydrophilic interactions, and cell surface area to volume ratio. Activities hone graphing skills, help students learn about selective biological stains, and prepare them for biochemistry. Developed by biology teacher Ryan Argot. Grades 9-11. 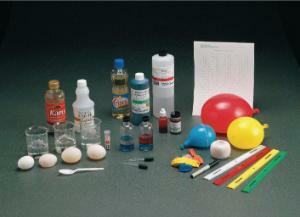 Includes materials for 10 student groups: graphing paper, oil, string, 70- 9” round balloons, 10 metric rulers, 10 stir rods, 500mL Methylene blue, 10g Sudan III,, dropper bottle, glucose syrup, vinegar, ethyl alcohol, instructions.